A team of researchers from the University of Illinois at Urbana-Champaign, the United States, the Institute of Photonic Sciences (ICFO) and the UPC uses experiments with ultra-cold atoms, trapped and driven by lasers, to create a new topological insulator induced by the disorder. Artistic representation of a disorder-induced transition to the phase of topological isolation of Anderson. 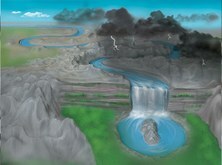 A river that flows along a straight path is altered by the mess in the underlying landscape. 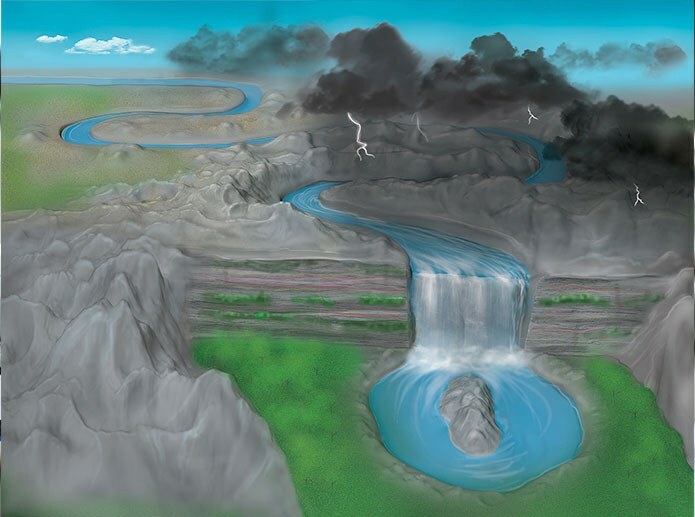 After going through a transition (waterfall), the River forms a closed circuit, a shape with a different topology of the way initially straight. In the phase of topological isolation of Anderson, the trivial band structure of a normal material is transformed into a topological band structure non-trivial due to the disorder in the couplings between the sites of the network. The index in the phase of the topological insulator of Anderson is different to the normal case without clutter. Lachina image Creative, copyright Bryce Gadway, University of Illinois at Urbana-Champaign. A team of researchers from the University of Illinois at Urbana-Champaign in the United States, the Institute of Photonic Sciences (ICFO) and the Department of Physics of the UPC used experiments with atoms ultra-cold, caught and driven by lasers, to create a new topological insulator induced by disorder. The unusual properties of this material opens up new technological applications in quantum computing, the next generation of miniaturized devices for storage or in spintronics. The results of this study have been published by the journal Science on 11 October 2018.